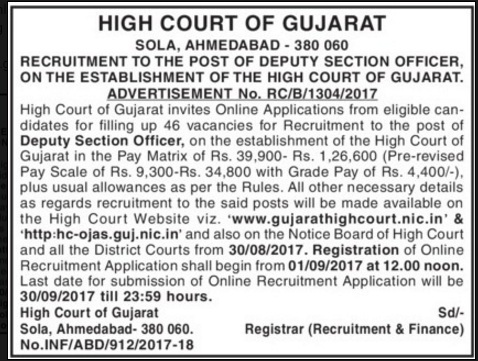 Gujarat High Court Jobs Recruitment 2018-2019 for Peon (Class IV) Posts: The Gujarat High Court at Gujarat has advertised a notification for the recruitment of Chowkidar, Liftman, Water Server, Home Attendant, Domestic Attendant, Jail Warder, Sweeper – 1149 vacancies. Candidates are Interested in the Vacancies details and passed 5th, 8th, 10th, 12th, ITI Pass, Graduate, PG, Degree/ Diploma Examination. Candidate may Apply Online Registration on or before 01-11-2018 to 30-11-2018 Hrs on wards. Qualified in 10th, 12th Class pass. More qualification details refer the official notification. Candidates age limit is 18 to 33 years as on 30-11-2018. Age relaxation is as per Govt rules. Applicant have to pay Rs.300/- for General category and Rs.150/- for Reserved category. Interested candidates can apply online application forms by visiting the website “www.gujarathighcourt.nic.in” from 01-11-2018 to 30-11-2018 Hrs on wards. Online Application Begin: 01-11-2018 Hrs. Last Date for Applications: 30-11-2018 at Hrs. Date of Exam: 17-02-2019 Hrs. 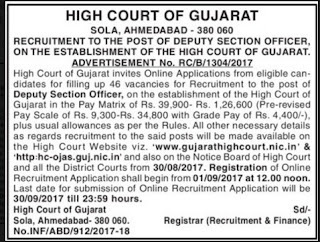 Gujarat High Court Jobs Recruitment 2017 for Deputy Section Office Posts: The Gujarat High Court at Gujarat has Released Recruitment Notification for Deputy Section Office – 46 vacancies. Interested for getting Deputy Section Office Vacancies, May apply Online Registration on or before 31-08-2017 at 30-09-2017 Hrs on wards. Qualified in Graduate from recognized University, 10th or 12th Standard Examination Passed with English as one of the Subject. Candidates age limit 18 - 35 years as on 30-09-2017. Age relaxation is as per Govt rules. Interested candidates can apply online application forms by visiting the website “www.gujarathighcourt.nic.in” from 31-08-2017 to 30-09-2017 Hrs on wards. Gujarat High Court Recruitment 2017-18 for Deputy Section Officer Posts: Gujarat High Court has Released Recruitment Notification for 46 - Deputy Section Officer vacancies. Interested for getting Deputy Section Officer Vacancies, May Apply online from 01-09-2017 to 30-09-2017 at 23:59 Hrs on wards. Applicant can deposit Rs.500/- for UR/ OBC Candidates and Rs.250/- for SC/ST/EBC/PH Candidates. through Cash Voucher at any SBI branches. Interested candidates can apply online application forms by visiting the website “www.gujarathighcourt.nic.in” from 01-09-2017 to 30-09-2017 at 23:59 Hrs on wards. Gujarat High Court Recruitment 2017-18 for English Stenographer Grade II Posts: Gujarat High Court has Released Recruitment Notification for English Stenographer Grade II – 09 vacancies. Interested for getting English Stenographer Grade II Vacancies, May Apply online from 16-08-2017 at 12:00 PM to 31-08-2017 at 23:59 Hrs on wards. Qualified in Graduation from recognized University, Speed of 100 words per minute in English Short Hand, Knowledge of Computer Operation, CCC / CCC+ level Certificate, or Degree/ Diploma from any recognized University/ Educational Institution with computer as one of the Subjects, or; have passed SSC or HSC examination from recognized School Board with Computer as one of the Subjects, or Courses prescribed by the Government. Candidates age limit is 18 to 35 years as on 31-08-2017. Age relaxation is as per Govt rules. Applicant can deposit Rs..250/-plus the usual Bank Charges for Candidates belonging to Scheduled Castes, Scheduled Tribes, Socially & Educationally Backward Classes, Differently Abled (PH) Personsor Ex-Servicemen, Rs.500/- plus the usual Bank Charges and all other candidates by making remittancethrough any of the Core Banking Service Branches of the State Bank of India, using the ‘Cash Voucher’ in the Special Format appended to this Advertisement during Bank working days and hours. The Candidates making payment of such Fees, shall remit the same into Current Bank Account No. 30725811785 with the State Bank of India, High Court Complex Branch, Ahmedabad, held in the name of Registrar General, High Court of Gujarat, Sola, Ahmedabad. Interested candidates can apply online application forms by visiting the website “www.gujarathighcourt.nic.in” from 16-08-2017 to 31-08-2017 at 23:59 Hrs on wards. Gujarat High Court Recruitment 2017 for Stenographer Grade-II (English & Gujarati) Posts: Gujarat High Court has Released Recruitment Notification for Stenographer Grade-II (English & Gujarati) – 109 vacancies. Interested for getting Stenographer Grade-II (English & Gujarati) Vacancies, May Apply online from 01-08-2017 at 12:00 PM to 15-08-2017 at 23:59 Hrs on wards. Qualified in Graduate in any discipline from a recognized university or any equivalent qualification recognized as such by the Government with Basic knowledge of Computer Operation and knowledge of English, Gujarati & Hindi Language. Candidates age limit is 21 to 40 years as on 15-08-2017. Age relaxation is as per Govt rules. Applicant can deposit Rs.250/- (plus Bank Charges) for SC/ST/PwD/Ex-ser. candidates and all other Candidates shall be required to pay fees of Rs.500/- (plus Bank Charges). Through any of the Core Banking Service Branches of the State Bank of India, using the Special Format of 'CASH VOUCHER', as appended to this Advertisement, from 01-08-2017 to 15-08-2017, during the Bank Working Days and Hours. Interested candidates can apply online application forms by visiting the website “www.gujarathighcourt.nic.in” from 01-08-2017 to 15-08-2017 at 23:59 Hrs on wards.